It's HUMP day! When I worked, we used to say we could see the weekend from here! Today's card is for the challenge at Sassy Cheryl's, #172 Bling/Sun or both. I colored the digi with copics and fussy cut them out. Wow Sue, what a wonderful card!!! I so wanna just do the same the girl does. Sadly it's much too cold here in Germany. I love the sun stamp. oooooohhhhh she is so adorable wonderful scenery you have made Sue. Gorgeous card Sue. I love the image and such a wonderful scene you have created. this is so sweet, the girl with the dog. so lovely. you made a beautiful scenery card!! summerfeeling....but here in Netherlands, is not warm yet to do the tings how the girl lying in the grass enjoying the sun. Totally amazing, Sue! You can almost feel the soft breeze! 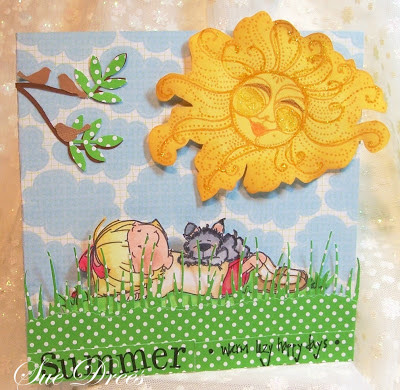 Oh so wonderful summer card ! Love the big sun !! Lovely scene ! Another fantastic summer card, wow love that sun! I just want to go lie on the grass and look at the clouds with her:O)! Way to darn cute!! I love the polka dot grass and that AWESOME Sun! your coloring is wonderful! Thanks for playing along in our Sassy Cheryl "Bling on the Sun" challenge this week! What a cute and sweet card! So cheery. Love it! Sue - this is sooooo cute! I love your sun and polka dot grass. Sweet image too. Darling in every way. Hugz! OH. MY. GOSH Sue. . . this is just ABSOLUTELY STUNNING!!!!!!!!!!! I love EVERYTHING about the card, but I have to say, that grass is AWESOME!!!! So fun and creative. It's just gorgeous. Thanks for playing along in the Bling in the Sun challenge this week with the Sassy gals this week. Oh gosh this is cute. Love that big ole sun stamp So perfect. Your colors are vibrant that they just pop out of the page. Sure do love this. Hi, Sue! Fantastic! The polka dotted grass is such fun, too! Beautiful summer scene! I'm so glad you joined us this week for the Sassy Cheryl's Challenge. Oh my goodness how sweet. When I was a girl, after my chores were done, I would lay on a blanket under a big maple tree and look at the sky. My sun didn't have a sweet face like this one...lol I would read books until it was time for dinner. Brings back memories of lazy childhood days. This is just too cute for words!